This trippy intro track isn't necessarily a fully fleshed-out song, but more as a tone-setter for the rest of the album, and it does that pretty well. The sound of a film reel that is eventually joined by delayed guitars, looped voices, and white noise is a pretty solid sampler of what themes are stored on this album: Cinematic, adventurous, and a little bit strange. This song is really where the album starts, and it sounds like a jam session from 1967 that was unearthed and polished up with the wonders of modern recording technology. The mid-tempo gallop carries the track along, and the layering of synths and echo-y guitars give the song a really cool psychedelic vibe. The harmonies and melodies are pure Summer of Love-era rock, and do a great job of paying tribute to that genre while still sounding modern and fresh. Think Tame Impala meets CSNY, and you have this solid little tune. Right off the bat, this song seems to take more cues from 1980s pop, but is produced without the excess polish associated with that period. That "pure-80s" sound can lead many indie acts into an uninspiring nostalgia-filled hole, but Corbu have steered clear of that trap by mixing their more vintage late-60s style with the 80s beats, resulting in a unique and fresh spin on dance-pop. It's a quick, catchy, and easy track to jam to, and is so far one of the strongest tracks on the record. This track is a slow burn driven by an unrelenting kick drum pattern, which works well at building up intensity as the song progresses. It's subdued, but implies something explosive lingering under the surface with it...but that implication doesnt really seem to go anywhere. I was hoping for some kind of release after building up for so long, but the song just seems to end without any resolve. It's a fine track, but I would like to have heard a little more exploration or payoff in the conclusion. I guess the best way to describe "Branches" is simply "cosmic," mostly because I found myself impulsively doodling stars and spaceships in my notes as I listened to this track. The first half is filled with ambient layering and a heavy drum machine beat, and uses echoing and dissonance to get a dark and unsettling tone. This part of the song sounds like it would fit well on a movie soundtrack for a dystopian future movie, like one of those films where the hero saves the world from a Big Brother-esque dictator with the power of music. Anyway, sci-fi musical pitches aside, the track eventually transitions to a trippy jam session that sounds makes you feel like you're floating through the cosmos with no particular destination in mind. Of all the tracks on the record, this one hits the "cinematic" idea the hardest, and to the greatest effect. This song features a tropical dance-hall beat, which currently seems to be all the rage in mainstream pop radio. However, the track still stays true to the album's overall late-60s vibe, featuring some harmonies that would make the Mommas & the Poppas proud. This song is what I imagine it would sound like if a hippie commune got stranded on an island somewhere in the Caribbean and just went with it. Overall, a very cool and notable track thanks to its mix of current and old genres and influences. This track provides an opportunity for the synths to take a backseat and let the bass and guitar show off and drive the song, which gives the track a cool jam session vibe. There's a nice sense of spontaneity on this track, with new ideas being thrown in as it progresses and are seemingly never done the same way twice. It's a cool song to jam out to in the background and a good halfway point for the record. MGMT fans may enjoy this one, since it's filled with a solid blend of catchy pop hooks and ambient psychedelic instrumentation reminiscent of the indie legends' style. This track plays on dynamics particularly well, knowing the right moments for when it needs to be quiet and low-key versus loud and forceful. Also, there's some pretty cool vocal layering to look out for in the last chorus. Definitely one of the most subdued tracks on the album, "Marching Orders" starts with a simple drumbeat and telephone-like vocals before gradually adding bass, acoustic guitar, and eventually the full band setup with drums and synths. It's a contemplative and somber track that matches the song's lyrics, which contemplate self-worth and if "your best" is good enough. With its drum beat that stays true to the songs title, "Marching Orders" is a beautifully crafted track that is a good song to play on a long drive while you're thinking about life and all its overwhelming greatness. This song uses the rhythm section to the fullest, as the majority of the track is driven almost exclusively by percussion and bass before opening up in the second half by throwing in guitars and keys for extra coloring. There are even moments where the vocals add to the percussive vibe, which is a pretty cool rhythmic touch. Maybe it's the nostalgia talking, but I'm getting a Tarzan-era Phil Collins feel on this song. I know just about everyone loves to hate on Phil Collins, but in this situation, I don't mean the comparison as a bad thing. Whether or not you consider it a bad thing is totally up to you. True to its name, "We Are Sound" starts off with sounds of a beach, complete with the ocean and seagulls. This is a good way to bring in the surfy guitar and upbeat vocals, making the song sound like a dreamy, radio-ready summer pop tune. It's happily jamming along until it does a fake-out ending about two minutes in, and then transitions into a darker and minor version of the first half before exploding into a futuristic clash of, well, sounds. The fake ending was a pretty cool touch, and helped the track stand out more than it would have if it was played as a straight pop song. For being such a far-out and adventurous album, I was kind of surprised the band went with a more subdued, minimalistic track as their closer. The album caps off with a whisper rather than a bang, as the song is driven by handclaps and acoustic guitars while heavy synths remain in the background for extra coloring and doesn't venture much farther from that setup. It's not an epic and loud finisher, taking the more contemplative and atmospheric route, and I personally would've liked a more resolute conclusion. It's a fine track on its own, but I don't think it has the weight and memorability needed to properly end the record. So, is it a straight up concept album, with characters and a story and the whole lot? No, but Crayon Soul does really well in immersing the listener in a cosmic and adventurous world and feeling like a generally complete, cohesive record rather than a couple singles and filler indiscriminately thrown together. If you're a fan of Tame Impala or MGMT, you'll feel right at home, but Corbu also bring something new to the table by occasionally throwing in mainstream genres into their sound while still staying true to their indie and vintage influences. 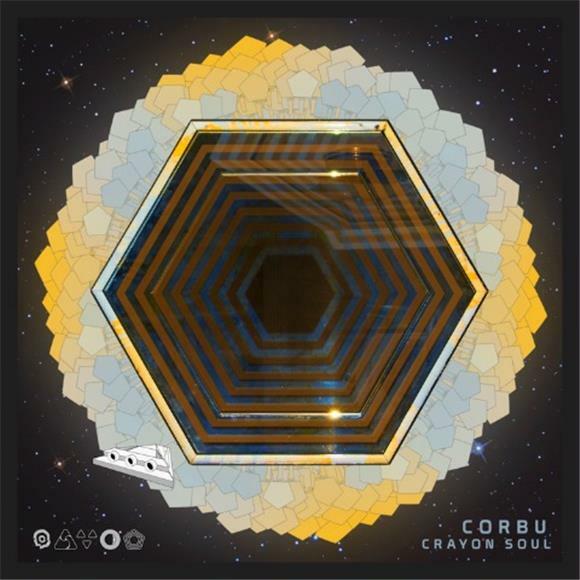 There were a couple moments where I feel like the ideas could've been explored a little further, namely the ending, but overall, Crayon Soul is an incredibly creative effort by Corbu and offers plenty of catchy tracks to enjoy.